If you want to get the most from traveling—while paying the least—here’s how to do it. Some years ago I wrote a manuscript for a book to be called “Teach Your Way Around the World,” based on my experiences as an itinerant English teacher, moving from country to country offering conversation classes, and deriving great satisfaction from the experience. A well-known publisher hemmed and hawed over my manuscript for a year but finally rejected it because I had not resolved a major problem: the illegality in most countries of taking pay for conversation classes without a work permit. Now, years later, I discovered that programs for living abroad have been developed that allow travelers to barter work for food and shelter, entirely avoiding the requirement and bureaucracy of work permits. 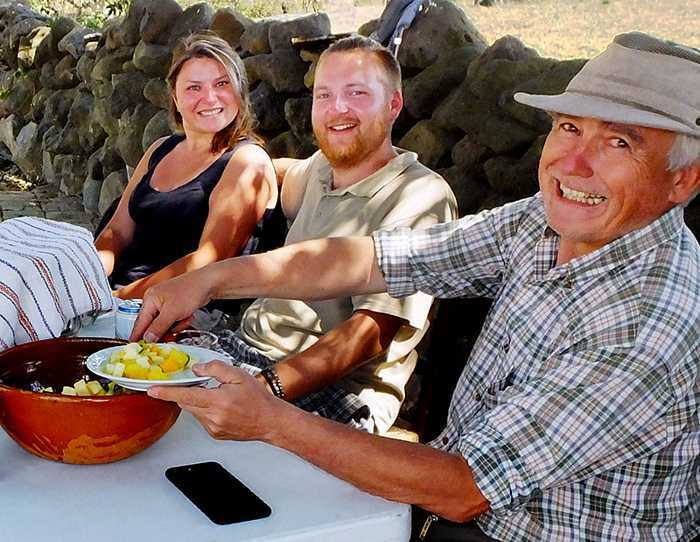 Mexican rancher, Salvador Mayorga, right, with Workaway volunteers from Italy and Germany, who have prepared "Pico de Gallo, European style." I checked out Workaway on the web and found it’s an organization started in 2002 by a young man who thought that exchanging a few hours of work for accommodations and food could open new horizons for youth—or retirees, for that matter—yearning for an in-depth experience abroad. The website simply matches up volunteers and hosts, Uber-style. Always up for an adventure, my neighbor Josh immediately accepted my suggestion to camp out at Rancho El Méxicano and meet Salvador’s volunteer guests. The ranch is located on a high plateau overlooking the city. Although it is only eight kilometers north of the Periférico, getting there requires taking a 62-kilometer circuitous route to cross the humongous Santiago River Canyon which half-encircles the city of Guadalajara. 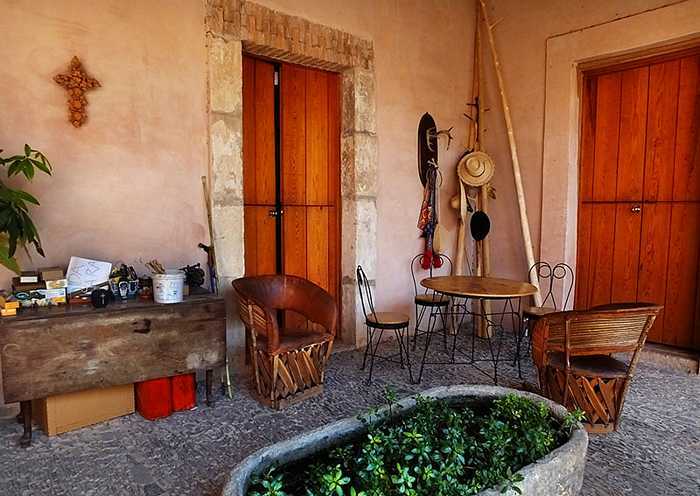 After a two-hour drive, country roads brought us to Salvador Mayorga’s adobe ranch house where we enjoyed cool drinks while chatting with two of his work-exchange volunteers, Ludivine Delesque and Adenäis Milizia, two French girls. 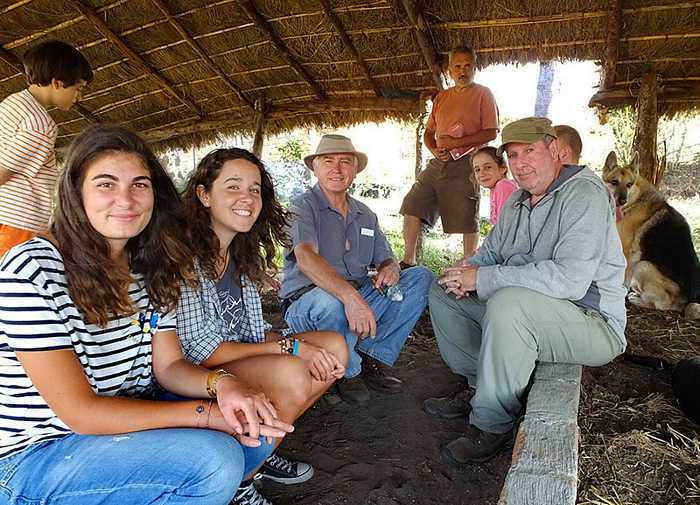 French volunteers Adenäis Milizia and Ludivine Delesque with host Salvador Mayorga, inside a state-of-the-art shelter for producing compost with the help of Red Wiggler worms. “What kind of work are you two doing here?” I asked Adenäis Milizia. 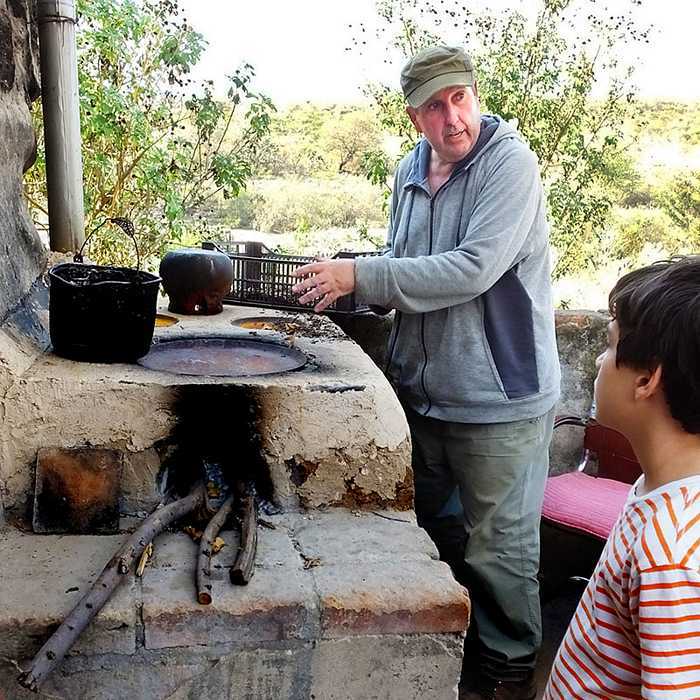 Next I turned to the owner of the ranch, Salvador Mayorga, who, for over a decade, was Director of the huge Bosque la Primavera forest west of Guadalajara. Said Mayorga, “I first heard about Workaway a year ago from my friend, Eduardo Castañeda. Together we uploaded my information to the website. We described the rancho here and its remote location and made it clear that we have no electricity. Well, would you believe it, over the last year we’ve had over 50 volunteers come to stay here and they have really transformed my rancho! We’re in a lonely place but with a smartphone and Google Maps, it’s easy to reach us and to communicate, so, thanks to new technology, this kind of interaction works smoothly. For example, an Englishman named Andrew arrived here three weeks ago from Oaxaca on a little delivery-style motorbike with a 150 cc engine and yesterday he continued on his way to Baja California. De veras, I wouldn’t be surprised to see the next volunteer arriving by hang glider! Rancho El Mexicano in the middle of nowhere..."No electricity" is a big attraction." Rancher Mayorga says he’s so impressed by the mobility of the millennials that he himself plans to sign up on Workaway as a volunteer so he can go touring France on a motorbike to visit some of the people who stayed with him in Mexico. At Workaway.info, hosts can sign up and describe their locations free of charge. Potential volunteers, instead, pay a low yearly fee (currently US$34 for one person, $44 for a couple) for access to the contact information of all the hosts. Workaway presently offers some 34,000 site choices in over 165 countries. Other organizations which offer somewhat similar arrangements are Wwoof, Hippohelp, Volunteers Base and HelpX. Never before have so many low-cost choices been available for those bit by the travel bug. Go for it!